For nearly a year, candidates for the open 15th District State Assembly seat in the East Bay have been raising money, knocking on doors and participating in an endless series of debates and forums. On Saturday, they had to put their stump speeches aside and focus on two ideas that may seem out of place during campaign season: empathy and caring. 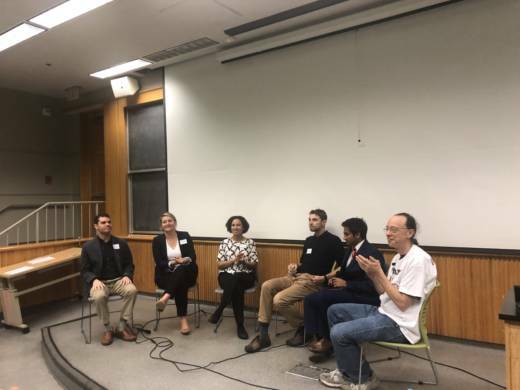 The goal of the Radical Empathy Forum was to get candidates in one of the state's most competitive legislative races to model active listening and to discuss how to build a more caring and empathic culture. "This is the first time that I’ve ever heard of anybody doing something like this," said Edwin Rutsch, the event's organizer and founder of the Center for Building a Culture of Empathy and Compassion. "We’re really pioneers for building a new movement." The forum's guinea pigs were nine candidates in California's most crowded legislative race, where 12 contestants are vying for a rare open seat that represents the liberal cities of Oakland, Berkeley and Richmond. The high-minded discussion may have been an only-in-Berkeley event, but even here contestants initially struggled with the format. Candidates addressed an opponent, who was then required to repeat back what they had heard. "I’m actually struggling with how to begin this conversation right now," said East Bay MUD director Andy Katz. "So you’re struggling with how to begin the conversation," replied political strategist Buffy Wicks. Will Universal Basic Income Message Resonate in the Liberal 15th District? After months of candidate forums, these Assembly hopefuls could probably recite each others' talking points. Now, they were required to. "Buffy thinks we need to fix our broken politics and really work on active listening," parroted Rochelle Pardue-Okimoto, a coucilmember from El Cerrito. Eventually, the candidates warmed up, and began to share stories of personal experiences where they gained empathy for someone else. The issues that have dominated previous forums, like housing and health care, took a back seat. "It had a more personal quality," said Rutsch. Contracts consultant Cheryl Sudduth said it was important to shed the "soft" stereotype around empathy. "If you’re going to empathize with me, you need to know my story and where I come from and know that sometimes that’s a painful conversation," she said. "So let’s have an honest dialogue, or it's not true empathy, it’s sympathy." Another challenge: using the 'empathy circle' model to bridge the partisan divide on issues that split Democrats and Republicans in Sacramento and Washington. "Listening to the other side is this beautiful idea in theory, but when it comes to actually doing it, people can get really emotional," said Pranav Jandhyala, the lone Republican in the race. The conversation, broken into two panels, remained meta: candidates were asked to discuss solutions for making society more empathic, but not for answers on adding empathy into their future day-to-day work as potential lawmakers. Writer Owen Poindexter said he hoped the emphasis on empathy could extend beyond gaining a better understanding of fellow candidates. "As a legislator there is a lot that can be learned from an empathy circle in connecting people," he said. But by actually passing legislation to improve society "you can be empathic in a different way," he added. A few of the candidates left the forum vowing to at least try to bring the exercise to the Capitol if elected. "They would say ‘Wow you must be the representative from Berkeley,'" said Pardue-Okimoto. "But maybe we could bring an empathy circle to one of the caucuses and really work on our human relations skills with one another as Assemblymembers."